In recognition of Norway’s 100th anniversary of independence, this exhibit features a small sample of works created by Norwegian-American artists from the Luther College Fine Arts Collection. While a universally accepted definition of "Norwegian-American art" has not been determined, the definition followed by the Chicago Norske Klub of 1920 still serves us today. 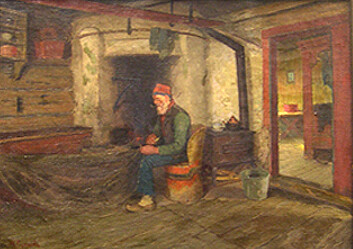 Norwegian-American art was then defined as "painting and sculpture produced by artists with Norwegian backgrounds." 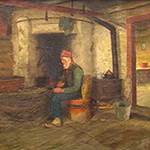 Over 160 works in the Luther College Fine Arts Collection were created by first or second-generation Norwegian-American artists. Several paintings by Emil Bjørn that depict significant events from Norwegian history are displayed in the lounge area on the upper floor of the library, along with a large bronze bust by Sigvald Asbjørnsen. A colorful painting by John Maakestad can be found to the far left as you exit the 3rd floor staircase. The main floor hallway holds works by Herbjørn Gausta, Arne Berger, Ben Blessum, Marie Løkke, Charles Beck, Cyrus Running, Orville Running, and Paul Running. Also on the main floor, look for a bronze bust of Herman Amberg Preus sculpted by Gilbert Risvold, and near the stairway a painting by Herbjørn Gausta titled The Fruit Vendors. Orville Running created another large painting, Campus Rock, which hangs near the elevator. Several other works by Norwegian-American artists are found throughout the Luther College campus. In Centennial Union, a large group of paintings by various artists hangs in Hammarskjöld Lounge, and a series of woodblock prints by Orville Running adorns the Nobel Room. A recently restored portrait of Martin Luther, painted by Arne Berger, hangs in the Loyalty Conference Room, while on the campus grounds, Tarkjel Landsverk’s Pioneer Memorial, located on the south side of Koren, is worth a visit.